Located in Manukau City, SULO NZ's newly assembled production facility utilizes state-of-the art injection moulding equipment with the ability to manufacture a variety of waste wheelie bin and recycling containers. The facility contains two fully automated modern-designed Husky Injection Moulding machines and includes an online dual lid hot stamping machine, allowing products to be easily customized during production. 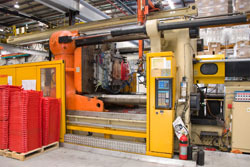 The SULO NZ facility boasts two of the largest injection moulding machines in New Zealand.